What is Career & Life Planning Services Specialty Training? Career & Life Planning Services Specialty Training is a 6-week distance training class designed to give ADHD Coaches the competencies, tools and expertise needed to assist clients in the “career piece” of the coaching process. Participants may choose to receive either 13 CCEU’s from International Coach Federation (ICF) or 13 CCEU’s from Center for Credentialing & Education (CCE) after completion of the training. Participants will gain specific knowledge, tools and expertise needed to work with individuals with ADHD on career issues, both initial, long-term decisions and evolving issues in mature adults. Why does an ADHD Coach need Career & Life Planning Services Specialty Training? What are the benefits or How would a Coach benefit from the CSST? For maximum effectiveness, coaching must be a collaborative effort that utilizes sound practices and methods, targeted at the entire person. Often in the coaching profession, we work with clients on a host of priorities, always including the multi-faced puzzle-pieces that make up our complicated species. Often too, when we reach the place along the coaching path that deals with the “Career Piece,” we are forced to stop our process, and hand the client off to a career professional to address that.What we especially find with the ADHD population is that this “handing off” process can be disruptive of the coaching relationship we have established, and can further lead to losing the client, due to loss of follow-through on their part, or lack of collaboration with the career professional.In order to be more inclusive in your services, it is now possible for you to gain the valuable tools and skills needed to be able to address the “Career Piece” within your coaching practice, and therebyretain more clients through to completion.What are the Career Advantages to completing this course? Upon successful completion of the CSS Training, ADHD Coaches will receive a certificate indicating that they have taken the course, and indicating that they may use the credentials “CSS” following other professional credentials, in order to indicate that they are an ADHD Coach who now has the competencies, tools, understanding and expertise needed to assist clients in the “career piece” of the coaching process. All coaches who successfully complete the CSS Training will receive a total of 13 CCEU’s (9 in Core Competencies and 4 in Resource Development). All coaches who successfully complete the CSS Training, and obtain the CSS credentials will be easily identifiable to potential clients seeking help from an ADHD Coach whose expertise spans into the Career Development arena, and thereby significantly enhancing the probability that clients may succeed in reaching stated coaching goals. Career & Life Planning Services Specialty Training is a 6-week distance trainingclass. PRIOR to the start of class, participants are required to obtain a copy of the book, Finding A Career That Works For You, by Wilma Fellman, M.Ed., LPC, Second Edition, 2006,Specialty Press, Inc. Plantation, Florida. If you choose to buy it at Amazon, Edge will appreciate you going to our website and accessing Amazon through us, as we get a small referral fee, and you will be supporting Edge at the same time. At the start of each week of class, participants will receive a Lesson by Email, to be completed within the week. Participants will be given a Pre-test at the start of the lesson, as well as a Post-test at the conclusion of the week’s lesson. Participants will attend a “real-time” 2-hour phone class, during which time they will be expected to interact using the skills obtained for that week. The 2-hour phone class will be on Thursday of each week, for 6 consecutive weeks. These sessions are mandatory and will reinforce the competencies needed for course completion. A one-hour supervision session will be scheduled by phone, one on one, with each participant and a CSST Trainer…following the completion of the course. This opportunity should enhance the ADHD Coach’s hands-on functioning with actual clients, in the arena of Career & Life Planning Services. Further Supervision will be available if desired, at an additional cost and individually arranged. What are the requirements for taking CSST? Career & Life Planning Specialty Services Training, a groundbreaking and unique program, is available to Edge Coaches at a discounted fee of $600.00. CSST Training is open to all ADHD Coaches certified from an Accredited ADHD Coaching Institution at the regular fee of $750.00. Coaches should have a minimum of two years experience as an ADHD Coach, and a minimum of 10 clients. Participants should be aware of the specific dates of the class in which they are enrolled, in order that attendance and completion of all course requirements be feasible. Successful completion is dependent upon full participation of all assignments, testing and “real-time” class interaction. Who are the CSST Trainers? Victoria Roche, MSW, PCC is a certified Professional Coach through the International Coach Federation. She received coach training with Mentor Coach and completed ADHD coach training through the American Coaching Association. Victoria is a Certified MBTI Practitioner and holds a certification through CPP to administer the Strong Interest Inventory. She has been coaching ADHD clients, high school through adulthood, in career and workplace counseling for the past 10 years. Victoria has incorporated Wilma Fellman’s model of Life Planning and Career Coaching into her coaching business. Lynn Miner-Rosen, M.Ed., BCC is an Edge Coach who is a Board Certified Coach credentialed by the Center for Credentialing and Education; Certified Life Coach from ILCT; and ADHD Coach from JST Coaching & Training. Lynn’s specialty is working with high school and college students with ADHD and Executive Functioning challenges. Lynn is also a Career Services Specialist (CSS) using Wilma Fellman’s model of Life Planning and Career Coaching for young adults and adults with ADHD. Prior to coaching, Lynn was a Special Education Teacher for 12 years and she had a successful career in the Fashion Industry in Los Angeles and New York City. Enroll in Training Today! 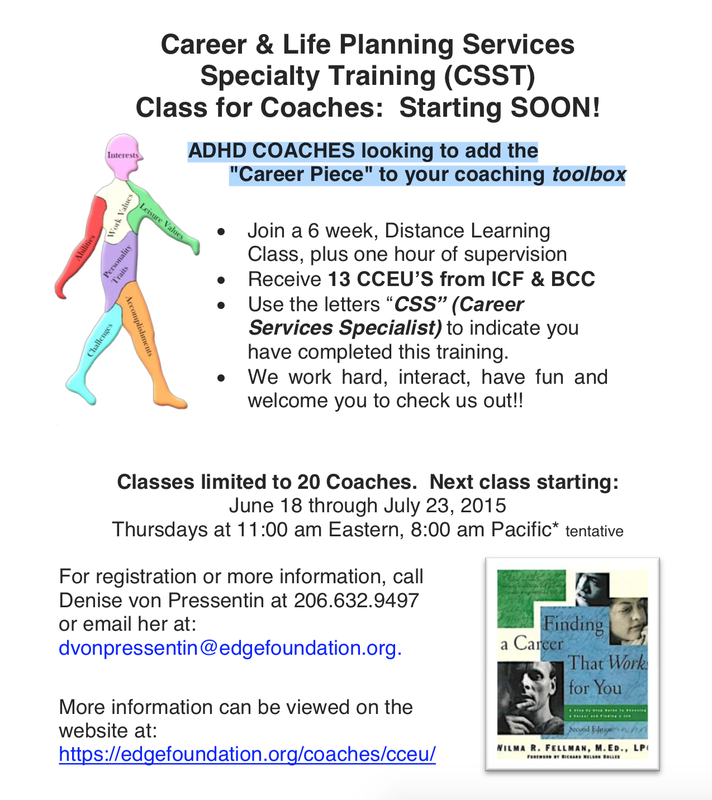 Contact Denise von Pressentin, Edge Foundation, at 206.632.9497 or email her at dvonpressentin@edgefoundation.org.